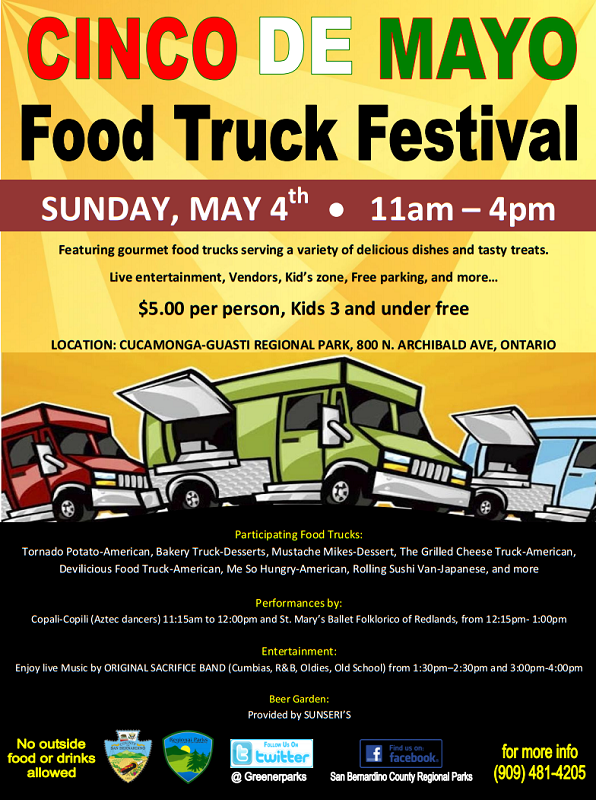 Cucamonga-Guasti Regional Park, 800 N. Archibald Ave., Ontario, will be the site of a Cinco de Mayo food truck festival on the Cuatro de Mayo. 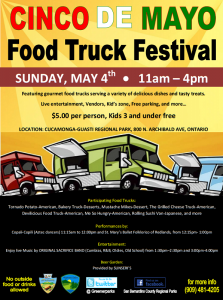 The event runs 11 a.m. to 4 p.m. Sunday (May 4). The festival also features live music and Aztec and Folklorico dancers. Admission is $5, or free for kids three and younger. Head to Carl’s Jr. on Monday (April 28) for a buy-one-get-one-free deal (with coupon) on the chain’s new Western X-tra Bacon Thickburger. The coupon can be found here. Carl’s Jr. locations can be found throughout the Inland Empire. Scanning through our Twitter feed, I spotted a tweet from the MexiCalbi Fusion truck mentioning that they were going to be at the Pomona Fairplex tonight (April 24). Did a quick check and found out that, indeed, Food Truck Thursdays have returned to Fairplex. The annual Dining Out for Life fundraiser for AIDS and HIV support services returns to the Palm Springs area tomorrow (April 24). More than 40 restaurants are participating this year. The concept is simple: All you have to do is dine out at any of the participating restaurants on that day. The restaurants donate a portion of your meal — anywhere from a generous 33% to a staggering 75%, depending on the restaurant — to a designated AIDS service organization. In Palm Springs, that means Desert AIDS Project. Feisty Chicken & Grill, with locations in Rancho Cucamonga, Ontario and Glendora, has apparently flown the coop. 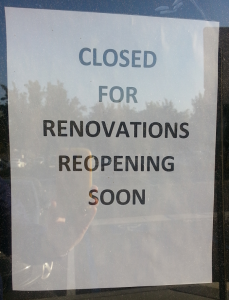 I first noticed that the Glendora location was closed several weeks ago. 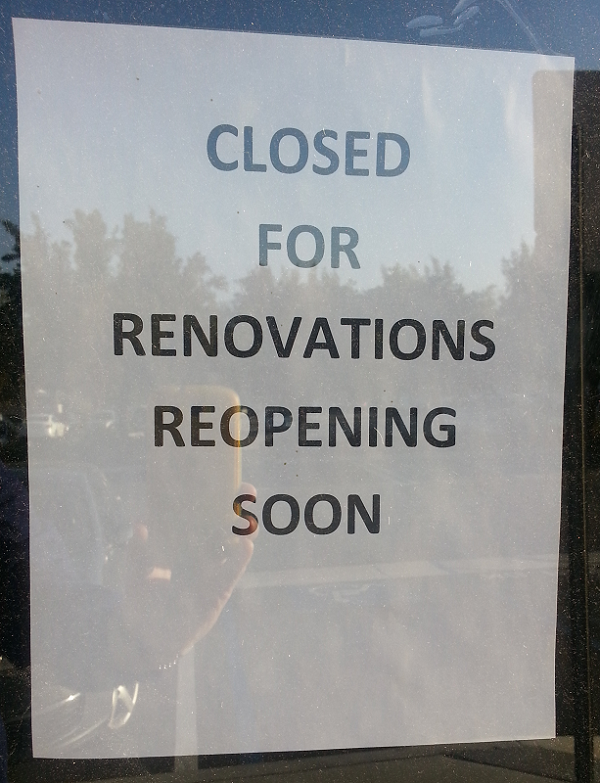 A sign posted in the window indicated they were remodeling and would reopen soon. Last week I drove by the Rancho Cucamonga location. Same thing. This week I checked on the Ontario location and found the sign you see above. No work was actively going on inside the restaurant. Riverside County’s first Pieology opens this Thursday (April 17). The new location is at 2347 California Ave., Suite 102, Corona. And before you ask, we don’t have an update on when the Upland location, 1071 E. 19th St., Suite A, (in the Colonies Crossroads) will open. Happy “Sweet 16” to Bert and Rocky’s Ice Cream! Claremont’s Bert and Rocky’s Ice Cream Company is turning “sweet 16” and is throwing a party this Saturday (April 12)! The celebration will take place from 11 a.m. to 3 p.m. at the Claremont shop, 242 Yale Ave.
Tamale fans can rejoice in the fact that the Riverside Tamale Festival is back for a second year of entertainment, family fun, contests, and of course, tamales! The festival will take place once again at White Park, 3936 Chestnut St., in downtown Riverside. The event will take place from 11 a.m. to 6 p.m. Saturday, March 19.